It is often stated and commonly believed that it takes gpm to overcome Btu. While I suspect that firefighters understand the underlying intent of this statement, it is actually incorrect as it is comparing apples and oranges. Flow rate is expressed in terms of volume and time (gal/m or l/m). However, Btu (or Joules) is a measure of quantity (more like volume than flow rate). You can say that it takes gallons (or liters) to overcome Btu (or Joules), But the rate at which energy is absorbed by a fire stream must overcome heat release rate (energy released/unit of time). This concept points to the need for a higher flow rate when the heat release rate from a fire is larger. This leads to another common fire service saying: �Big Fire, Big Water�. While this is not completely incorrect, it is a bit misleading as it does not account for the efficiency of the fire stream in absorbing energy. Not all of the water that leaves the nozzle absorbs the same amount of energy. Water is an excellent extinguishing agent because it has a high specific heat (energy required to raise its temperature) and high latent heat of vaporization (energy required to change it from water to steam). As illustrated in Figure 1, conversion of water to steam is most significant as it absorbs 7.5 times more energy than heating water from 20o C (68o F) to its boiling point. However, this only tells us the theoretical cooling capacity of a single kilogram of water at 20o C (68o F) if it is raised to 100o C (212o F) and completely vaporized. Examining theoretical cooling capacity in terms of flow rate requires a bit more work. Flow is defined in terms of gallons per minute (gal/m) or liters per minute (l/m) and theoretical cooling capacity of water was defined in terms of energy absorbed per second per unit mass (MJ/kg) we need to work through conversion to common units of measure. This example assumes instantaneous heat transfer and 100% efficiency in conversion of water to the gas phase. Neither of which is possible in the real world! The firefighter�s power is not simply related to flow rate, but flow rate effectively applied to transfer heat from hot gases and surfaces by changing its phase from liquid (water) to gas (steam). Extinguishing a compartment fire generally involves converting a sufficient flow (gal/m or l/m) of water to steam. So while the �steam� itself does not generally extinguish the fire, the energy absorbed in turning the water to steam has the greatest impact on fire extinguishment. Experimental data (Hadjisophocleous & Richardson, 2005; S�rdqvist, S., 1996) has shown that the cooling efficiency of water in both laboratory experiments and actual firefighting operations ranges from 0.2 to 0.6. S�rdqvist (1996) suggests that an efficiency factor of 0.2 be used for interior fog nozzles. Based on my personal observations (but no experimental data), I think that S�rdqvist�s efficiency factor of 0.2 might be just a bit on the low side. Barnett (as cited in Grimwood,2005) suggests that an efficiency factor of 0.5 be used for solid or straight stream application and 0.75 for fog application. The following table takes a slightly more conservative approach, using 0.6 as an average efficiency factor. Figure 3 is provided to illustrate the impact of efficiency (or lack thereof) on fire stream cooling capability. The key point is that actual cooling capability is considerably less than the theoretical cooling capacity. Another complication is that in addition to nozzle performance characteristics, nozzle efficiency is also dependent on the skill of the nozzle operator, the manner in which water is applied (straight stream, narrow fog pattern, wide fog pattern), the configuration of the space, and fire conditions. Unfortunately, there is no standardized test with specified conditions that permits comparison of different nozzles and/or methods. However, the concept of efficiency gives rise to an interesting question. Does a nozzle flowing 100 gpm with an efficiency factor of 0.6 have the same extinguishing capability as 200 gpm nozzle with an efficiency factor of 0.3. This is simple math! The cooling capacity would be identical. While the practical application is more complex (as we do not really know the efficiency factors for the two nozzles and manner in which they are being used), this is worth thinking about. CFBT-US Senior Instructor Trainer Matt Leech (LT Tualatin Valley Fire & Rescue) proposed (half in jest) that nozzles should be labeled with their potential cooling capacity rather than flow rate. While this idea did not get significant traction, it is important for firefighters to recognize that flow rate and fire stream characteristics have a significant impact on potential cooling capacity. Accomplishing this requires different stream characteristics at different times. The characteristics that are optimal for gas cooling are likely quite different than for cooling hot surfaces, particularly when dealing with fully developed fire conditions in a large compartment. As regular readers have likely noted my posting schedule has been a bit off of late. My responsibilities as the new Fire Chief with Central Whidbey Island Fire & Rescue preclude the necessary research and writing necessary to constantly post twice weekly. I will be scaling back to a single post on Thursday for the next few months while I get a handle on my new job and get my family moved to Whidbey Island. Hadjisophocleous, G.V. & Richardson, J.K. (2005). Water flow demands for firefighting. Fire Technology 41, p. 173-191. Svennson, S. (2002). The operational problem of fire control (Report LUTVDG/TVBB-1025-SE). Sweden, Lund University, Department of Fire Safety Engineering. The previous posts in this series, examined the importance of proficiency in use of the firefighters’ primary weapon in offensive firefighting operations, and outlined several drills that can be used to develop proficiency in basic nozzle operation and hose handling. Developing proficiency in nozzle use is somewhat like building skill with a rifle. Understanding what end of the rifle the bullet comes out of and that the rifle is fired by pulling the trigger is the easy part, learning to consistently hit what you are aiming at over varied distances requires considerably more effort. This is my nozzle, there are many like it but this one is mine. My nozzle is my best friend. It is my life. I must master it as I master my life. Without me it is useless, without my nozzle I am useless. I will use my nozzle effectively and efficiently to put water where it is needed. I will learn its weaknesses, its strengths, its parts, and its care. I will guard it against damage, keep it clean and ready. This I swear [adapted from the Rifleman’s Creed, United States Marine Corps]. In the first three nozzle drills learners develop basic proficiency in basic nozzle use (fixed position), integrating nozzle use while moving a hoseline forward and back, and use of the nozzle while moving the hoseline through varied size compartments. This post will provide an overview of door entry procedures. For many firefighters, door entry is simply a process of remembering to “try before you pry” and then figuring out how to force the door if it is locked. For others it is simply kicking the door in! Often overlooked is the fact that the entry point is a ventilation opening; sometimes an inlet, sometimes an outlet, and often both. When the fire is ventilation controlled, opening the door and increasing air flow to the fire will result in increased heat release rate. Depending on the stage of fire development and conditions within the compartment or structure, this may result in extreme fire behavior such as a ventilation induced flashover or backdraft (see Fuel & Ventilation). Note: Photos by Probationary Firefighter Tony George, Prince Georges County Fire Department. Safe and effective firefighting operations depend on effectively reading the fire and recognizing potential stages of fire development and burning regime (see previous posts on Reading the Fire) and effective tactical operations to take control of the fire environment. Door entry is an important element in this process. As you review this door entry procedure, you may find that it makes sense to you exactly as presented. On the other hand, you may find that some elements (e.g., size-up and dynamic risk assessment) make sense, but other components (e.g., cooling overhead prior to opening the door) require a bit more of a leap. The elements of the door entry process reinforce one another, adopt the elements that make sense to you, but consider the value of the procedure as an integrated process. The process outlined is not followed in a lock-step manner, it is important for the hose team to take action based on observed conditions. Size-Up: Door entry begins with a focused size-up as you approach the building. Assessment of conditions is not only the incident commander or officer’s job. Each member entering the building should perform a personal size-up and predict likely conditions. 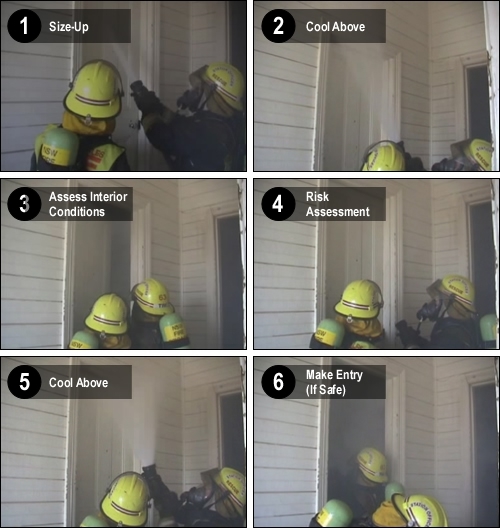 When making entry, size-up becomes more closely focused on conditions observed at or near the door and includes an assessment of potential forcible entry requirements as well as B-SAHF (Building-Smoke, Air Track, Heat, and Flame) indicators. If available, a thermal imaging camera (TIC) can be useful, but remember that temperature conditions may be masked by the thermal characteristics of the building. If a thermal imaging camera is not available, application of a small amount of water to the door may indicate temperature and the level of the hot gas layer (water will vaporize on contact with a hot door). Size-up begins as you exit the apparatus and approach the building, but continues at the door and after you make entry! At the door, pay close attention to air track and heat (door temperature) indicators as these can provide important clues to conditions immediately inside the building! Control the Door: If the door is open, close it. If it is closed, don’t open it until you are ready. Heat release requires oxygen, controlling the air supply to the fire controls heat release rate. If you force the door in preparation for making entry, make sure you maintain control of it. Gas Cool Above the Door and Assess, and Control Interior Conditions: When you open the door to assess conditions inside, hot smoke will likely exit at the top of the door. If it is hot enough it may auto-ignite. The hazard presented by the exiting smoke can be reduced by applying two short pulses above the door just as it is opened (the firefighter controlling the door should crack the door as the first pulse is applied). The door should be opened sufficiently to allow the nozzle operator to visualize interior conditions, but not so much that a large amount of air is introduced (no magic number on how far to open, “it depends”). If hot smoke is present, the nozzle operator should cool the gases inside the compartment from the doorway. This may involve a short pulse or two or it may involve a longer pulse, depending on the size of the compartment and conditions (again, this requires the nozzle operator to think!). Close the Door: While there is often a sense of urgency to make entry (due to developing fire conditions, persons reported, etc. ), this step is important as it provides an opportunity for a focused risk assessment. Risk Assessment: Is it safe to make entry (or to make entry through this opening)? Fully developed fire conditions inside the door or a pulsing air track (indicating potential for vent induced flashover or backdraft) may indicate a need to consider alternative tactics). Entry: If it is safe to make entry, the process of cooling above the door as it is opened is repeated and hot gases inside the compartment are cooled as the hose team makes entry. Note: Adapted from video clip 00000010 on the 3D Firefighting: Training, Techniques and Tactics Resource DVD. Remember: The purpose of door entry procedures is to reduce risk of extreme fire behavior during and immediately after entry! Door entry procedures should be used any time that hot smoke or flames may be on the other side of the door. These procedures are used at exterior doors when making entry and on closed doors encountered inside the building. Drill 4-Door Entry-Inward Opening Doors: Many doors (particularly interior and exterior residential) open inward (away from the nozzle team), door entry requires that the hose team integrate forcible entry, door control, and nozzle operation. Practicing door entry procedures with a variety of inward opening door configurations (location of the door in relation to walls and with varied size compartments) is critical in developing proficiency. Drill 5-Door Entry-Outward Opening Doors: Commercial doors (and some interior doors) will open outward (towards the hose team). Outward opening doors require a somewhat different position when performing door entry. Firefighters must develop skill in performing door entry with both inward and outward opening doors. 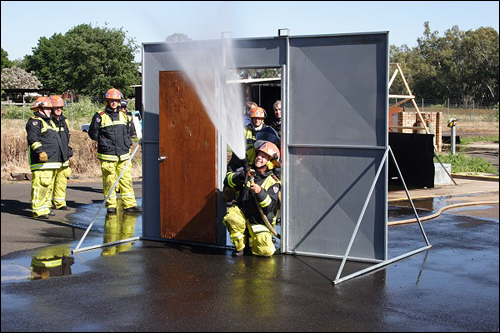 These two drills can be conducted using any door where water can be applied. However, a free-standing door entry prop (see Figure 3) provides a simple and effective aid to developing door entry proficiency. Note: Photo by Inspector John McDonough, ASFM, New South Wales Fire Brigades. Alternately, a forcible entry prop could be used to integrate the forcible entry component of the door entry process. As discussed in Nozzle Techniques and Hose Handling: Part 2 [LINK], it is essential for firefighters to have the ability to react immediately to deteriorating conditions. While battle drills will be discussed in depth in a subsequent post, consider how this concept might apply during door entry. What action should the hose team take if they encounter strong indicators of backdraft conditions at the doorway (e.g. pulsing air track, thick (optically dense) smoke)? How should the hose team react if, despite following good practice, conditions worsen immediately after entry? Grimwood, P., Hartin, E. McDonough, J. & Raffel, S. (2005). 3D firefighting: Training, techniques, and tactics. Stillwater, OK: Fire Protection Publications. Understanding how to develop fire streams has been critical since firefighters began to use hose and nozzles (Figure 1) to increase the effectiveness and efficiency of firefighting operations. Figure 1. In the Beginning! When selecting handline nozzles, firefighters and fire officers generally consider four nozzle characteristics: 1) type of nozzle (combination or solid stream/smoothbore), 2) fixed or variable flow, 3) flow rate, and 4) designed operating pressure. Saving the big debate regarding combination and solid stream/smoothbore nozzles for another post, this post will focus primarily on nozzle pressure and flow rate. A little over 20 years ago I was asked an interesting question by a newly hired recruit firefighter. She had no prior fire service experience and was puzzled by the hose evolutions being taught during her academy. As I attempted to help her make sense of these alien concepts, she finally asked �What�s the pump for? Why don�t we just put the nozzle on the end of the hose from the hydrant?� Her instructors may have assumed that hydraulics was a topic for apparatus operators or that everyone understood the basic concepts involved in developing an effective fire stream. The primary function of a nozzle is to increase the velocity of water flowing from the hoseline. A fire stream must have sufficient velocity for water to reach from the nozzle to the intended target. The simple equation illustrated in Figure 2 is essential to understanding nozzle design and performance. Flow rate (the quantity of water) from a nozzle is dependent on the area of the opening and the velocity of the water being discharged (for a given size opening, the greater the velocity the higher the flow rate). 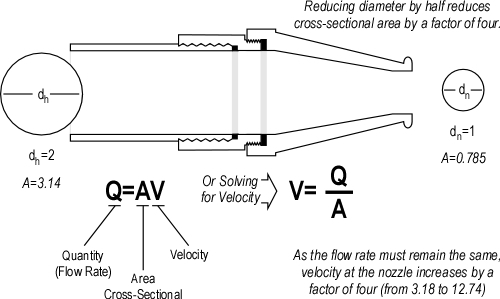 As indicated in the equation Q=AV, flow rate is related to velocity and the size (area) of the nozzle orifice. This relationship is simple to understand when looking at solid stream/smoothbore nozzles. Nozzle pressure translates to velocity at the tip. For a given size tip, increasing nozzle pressure increases velocity and thus the flow rate from the tip. For example, a 1-1/4� (32 mm) tip will flow 317 gpm (1200 lpm) at 50 psi (345 kPa). Increasing the nozzle pressure to 80 psi (552 kPa) increases the flow rate to 401 gpm (1518 lpm). Flow rate can be varied by changing the size of the tip, the nozzle pressure, or both. Visualizing nozzle orifice size is a bit more difficult with combination nozzles. Most combination nozzles use a deflection stem (see Figure 3) to form the fog pattern. The nozzle orifice is an annular (ring shaped) space between the deflector and the body of the nozzle tip. The change in direction at the deflection plate results in formation of small droplets of water. Nozzles may also have fixed teeth or a spinning, toothed turbine to aid in the production of appropriate sized droplets as water leaves the nozzle. Where the water is vaporized into steam depends on the method of fire control being used (direct attack, indirect attack, or 3D gas cooling). In direct attack water is vaporized on burning and pyrolyzing fuel surfaces to slow and stop the process of pyrolysis. Water is also vaporized on contact with hot surfaces in an indirect attack, but in this case the purpose is to produce a sufficient volume of steam to fill the compartment, achieving fire control or mitigating potential for extreme fire behavior such as a backdraft. Gas cooling on the other hand requires that the majority of the water be vaporized in the hot gas layer. This cools the hot gases (fuel) overhead, providing buffer zone and safer work environment for firefighters. It is important to remember that gas cooling is not an extinguishing technique, but merely one tool in controlling the fire environment. Heat moves from objects of higher temperature to objects of lower temperature until temperature equalizes. Key factors in the speed of heat transfer are the difference in temperature and surface area of the materials. In the fire environment, burning fuel, nearby surfaces, and hot gases are considerably higher temperature than the water used for fire control and extinguishment. Surface area of the water in contact with the material being cooled is extremely significant in determining the speed of heat transfer. A larger surface area in relation to the amount of water will result in faster heat transfer and more rapid cooling. If the volume of water remains the same, reducing droplet size increases surface area substantially. 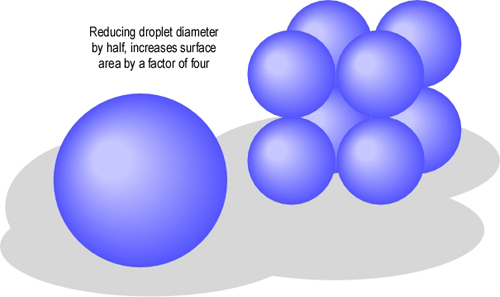 For example if droplet size is reduced by half, surface area increases by a factor of four (see Figure 4). Increased surface area increases heat transfer as droplets travel through the hot gas layer, rapidly reducing temperature. However, the down side of smaller droplets is that they do not travel as far and may not be able to penetrate a large distance in an extremely hot environment, making a fog pattern with small droplets potentially less effective in direct attack or when working in an extremely large compartment. Fortunately, when a fog pattern is adjusted to a straight stream much (but not necessarily all) of this problem is overcome. What does nozzle pressure have to do with droplet size? Nozzles do not produce uniform droplet sizes. The fog pattern developed by a typical combination nozzle produces a mix of small and larger droplets. However, average droplet size and the percentage of droplets that are 0.3 mm (0.012�) in diameter is dependent on both nozzle design and pressure. However, for any nozzle design, increased nozzle pressure will result in smaller droplets. Gresham Fire & Emergency Services conducted a series of qualitative tests on droplet size produced by the Task Force Tips Dual-Pressure Mid-Force Nozzle operating at 50 psi (345 kPa) and 100 psi (689 kPa). Droplet size was assessed by examining hang time, the time which droplets remained suspended in the air after a short pulse of water fog (smaller droplets remain suspended for a longer time while large droplets fall to the ground more quickly). Results of this test were captured on video and synched to ensure that the visual comparison was at the same time after the nozzle was closed. 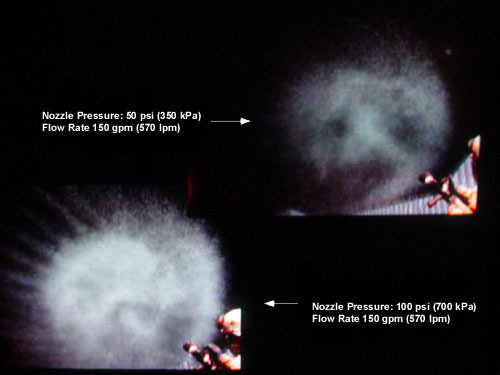 As illustrated in Figure 5, with the same flow rate, the nozzle pressure of 50 psi (345 kPa) resulted in larger droplets than a nozzle pressure of 100 psi (689 kPa). Nozzles operating at a lower pressure will have larger droplet size. This does not impact substantially on direct attack, but can have a significant impact on the effectiveness and efficiency of these nozzles when used for gas cooling. This does not mean that they cannot be used! It simply means that they will be less effective and are likely to result in less efficient vaporization of water (more water will end up on the floor). While it is important to understand the underlying principles related to nozzle design and performance, it is even more important to understand the impact of these concepts on firefighting operations. The next post in this series will examine the concepts of efficiency and effectiveness in greater depth and why effective cooling capacity may be more important than simply looking at flow rate. S�rdqvist, S. (2002). Water and other extinguishing agents. Karlstad, Sweden: Raddningsverket (Swedish Rescue Services Agency). Prior posts in this series, My Nozzle and Basic Nozzle Techniques & Hose Handling, examined the importance of proficiency in use of the firefighters� primary weapon in offensive firefighting operations. I will use my nozzle effectively and efficiently to put water where it is needed. I will learn its weaknesses, its strengths, its parts, and its care. I will guard it against damage, keep it clean and ready. This I swear [adapted from the Riflemans Creed, United States Marine Corps]. It is critical that firefighters have both a sound understanding of nozzle performance and skill in the use of their primary weapon. 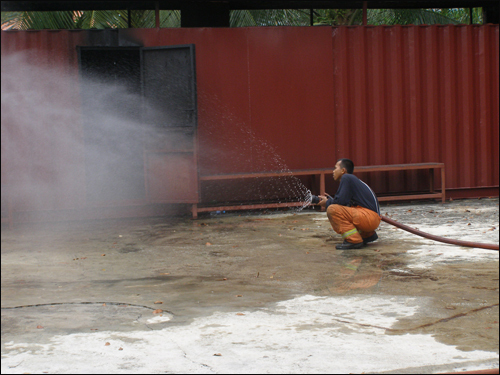 In Figure 1, Assistant Superintendent Mohamed Roslan Bin Zakaria, Bomba dan Penylamat, Malaysia examines stream characteristics from an Akron Turbojet. Note the change in droplet size as the nozzle is closed (droplet size increases as pressure drops). In a short pulse opening and closing the nozzle quickly minimizes production of large droplets that are unlikely to vaporize in the hot gas layer. In long pulses, closing the nozzle slowly increases the percentage of large droplets, but this is a necessary tradeoff to prevent excessive water hammer. Note: Photo by Shan Raffel, ASFM, CMIFireE, EngTech. This post continues with a discussion of training methods that can be used to develop proficiency in nozzle techniques and hose handling while deploying hoselines and in compartments having varied configurations. Continuing with our military metaphor, we will be practicing fire and maneuver. As discussed in Basic Nozzle Techniques and Hose Handling this sequence of drills is designed using the Simplifying Conditions Method (Reigeluth, 1999). This approach moves from simple to complex, beginning with the simplest version of the task that represents the whole and moves to progressively more complex versions until the desired level of complexity is reached. 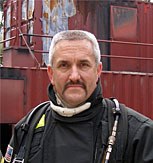 In the case of nozzle technique and hose handling, this involves moving from basic, individual skills, to team skills, and on to integration of physical skills and decision-making. While modeling a specific technique (such as the short pulse) can be helpful in aiding the learners in developing basic skill, there is a danger. Technique is often mimicked without thought to why it is performed in a particular manner under specific circumstances. Demonstration of a short pulse with a 40o fog pattern (which might be appropriate in a small room) becomes �that is how all short pulses must be performed�. As the learners complete Hose and Nozzle Technique Drills 2 and 3, it is critical to provide changing conditions and encourage the learners to adapt their technique based on conditions. Drill 2-Hose Handling and Nozzle Operation: Firefighters often lose focus on nozzle technique and operation when they are moving. This drill provides an opportunity for the firefighter with the nozzle and backup firefighter to develop a coordinated approach to movement and operation. Drill 3-Nozzle Operation Inside Compartments: Deployment of hoselines inside a building requires a somewhat different set of skills than simply moving forward and backward. Movement of hoselines around corners and adjustment of nozzle pattern to cool gases in hallways and varied size compartments are important additions to the firefighters� skill set and provide the next step in developing proficiency in nozzle use. Analysis of firefighter line-of-duty deaths (LODD) during structural firefighting operations points to the need for highly disciplined, immediate, and appropriate response to rapidly deteriorating conditions. In terms of military small unit tactics, battle drills provide a standardized, collective action rapidly executed without application of a deliberate decision making process (US Army, 1992). As a starting point for discussing this concept, give some thought to what situations might require a pre-planned and trained set of actions during offensive firefighting operations. For example, this might apply to locating a victim while deploying a hoseline for fire attack, rapidly deteriorating conditions, breathing apparatus malfunction, etc. Also consider how hose handling and nozzle techniques might apply in each of these situations. Reigeluth, C. (1999). Elaboration theory: Guidance for scope and sequence decisions. In C.M. Reigeluth (Ed.) Instructional-design theories and models: A new paradigm of instructional theory volume II. Mawah, NH: Lawrence Erlbaum Associates. 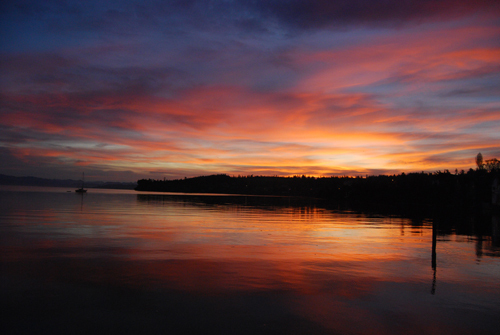 This morning I begin the process of relocation to beautiful Whidbey Island, Washington. Later this week I begin my new job as Fire Chief with Central Whidbey Island Fire & Rescue. As I have been packing and preparing for my move all weekend, I have not had time to develop an in-depth Monday morning post. However, I did run across an interesting video clip a few weeks ago that ties in well with our ongoing effort to develop skill in reading the fire. On March 27, 2009 the Emerson and Red Oak Fire Departments were dispatched for a residential fire at 901 Lowell Ave in Emerson, IA. First arriving companies observed a fire on Floor 1 and smoke throughout the structure. The following video clip appears to have been shot early in incident operations as positive pressure ventilation is being implemented. Download the B-SAHF Worksheet to use as a reminder while watching the video clip. As you view the video clip, what do the fire behavior indicators (particularly smoke and air track) tell you about the stage of fire development, burning regime, and effectiveness of tactical operations? Watch the video clip again and examine conditions at the inlet between 0:21 and 0:25. What does the presence of smoke (and particularly dark smoke) pushing from the inlet indicate? Continue the video and examine conditions between 1:02 and 1:10. What do you observe at this point? What do smoke and air track conditions indicate now? Continue on and examine conditions closely between 2:28 and 2:48. What does the variation in smoke and air track indicators at different points on the exterior of the structure tell you? I plan to be back on track with the next post in the series examining nozzle techniques on Thursday, November 12. I have been having an e-mail conversation BC Mike Walker of the Oklahoma City Fire Department regarding nozzle techniques and flashover. Mike is working on a research project regarding �right for reach and left for life�. Interestingly, when I received Mike�s first e-mail, I was in the process of outlining an upcoming blog post on the concept of �Battle Drills� to deal with or escape from conditions such as those resulting from unplanned changes in ventilation (window failure, wind, etc.). As discussed in prior Reading the Fire posts and the ongoing series examining fire behavior indicators (FBI), using the B-SAHF (Building, Smoke, Air Track, Heat, and Flame) organizing scheme, developing proficiency requires practice. This post provides an opportunity to exercise your skills using three video segments shot during an apartment fire. The Alexandria, VA fire department was dispatched to an apartment fire at the Parkfairfax Complex in the 3700 block of Lyons Lane. First arriving companies observed a large volume of smoke from the attic of a four unit, townhouse style condominium building. Video Segment 1 is shot from Side A, towards the A/D corner. Watch the first 2 minutes of this video clip. First, describe what you observe in terms of the Building, Smoke, Air Track, Heat, and Flame Indicators; then answer the following five standard questions? What conditions would you expect to find inside this building (on floor 2 and in the attic)? Watch the remainder of Video Segment 1 and identify if, and how conditions change from the beginning of the clip. What influence did the failure of the roof sheathing over the unit on Side B have on fire conditions in the attic? What concerns would you have about working on the top floor of the unit on Side B (and possibly Exposure D1)? Video Segments 2-5 illustrate fire conditions from several different perspectives and show fire development and the impact of tactical operations as the incident progresses. Note: These video clips will open in a new window. Video Segment 2 was short clip shot from the A/B corner. Video Segment 3 was shot from Side B. Video Segment 5 was shot from Side A at the A/B corner. While this incident had a positive outcome, it is important to recognize the potential for collapse of lightweight, engineered structural systems such as truss roof assemblies. Tactical success in one incident is not necessarily a predictor of future success should conditions be different (e.g., duration of fire impingement on structural members prior to arrival, burning regime, changes to the ventilation profile, etc.). The previous post in this series, My Nozzle, examined the importance of nozzle knowledge and skill in using the firefighter�s primary weapon in offensive firefighting operations. Note: These Fire Officers from Rijeka, Croatia are practicing the short pulse to place water fog into the hot gas layer. Droplet size, cone angle, position of the nozzle, and duration of application have placed water in the right form exactly where it was intended. This post continues with a discussion of training methods and techniques that can be used to develop proficiency in nozzle techniques and hose handling. Fire service instructor training and related instructional methods have direct linkage to the philosophy of vocational education that evolved in the United States in the early 1900s (Hartin, 2004). The philosophy of vocational education that evolved in the first half of the 20th century put forth a mechanistic view of training and vocational education in which the goal is efficient production of trained individuals (Allen, 1919; Prosser & Allen, 1925). In early fire service instructor training, basic concepts of vocational education were combined with behaviorist psychological concepts of positive and negative reinforcement to guide learning. Over the last four decades, fire service instructor training has evolved to include humanist perspectives on motivation and the characteristics of adult learners. However, the basic principles used in training factory workers to perform simple repetitive tasks remain the meat and potatoes of this theoretical stew. All very interesting, but what does this have to do with nozzle technique? The dominant focus of most fire service instructor training programs is on classroom instruction and to a lesser extent on demonstration of basic skills as an instructional method. Less focus is placed on effective methods for skills instruction (other than demonstration) and more importantly how to coach and provide effective feedback during skills instruction. Effectively and efficiently developing firefighters� psychomotor skills requires a somewhat different focus. There is a commonality between firefighters and athletes. Both require development of a wide range of physical and mental skills as well as underlying knowledge. A tremendous amount of research has been conducted on effective approaches to development of skill and proficiency in sport. Kinesiology (the science of human movement) and sport psychology provide a useful starting point for improving fire service skills training. While this post is focused on nozzle techniques and hose handling, the underlying theories can be applied to many other skills. It is essential that both the coach and the learner not only understand what needs to be done and how to do it, but why! Simply opening and closing the nozzle is a discrete task that predominantly involves motor skill, and takes place in a fairly predictable environment (the firefighters� position may change, but the nozzle remains the same). However, when placed in the context of hoseline deployment inside a structure with variable fire conditions things change quite a bit. This involves serial (multiple, sequential) tasks and requires both physical and cognitive (decision-making) skills, in a somewhat predictable, but highly variable environment. This explanation makes things seem a bit more complicated than they appear at first glance! Motor learning can be divided into several relatively distinct stages (Schmidt & Wrisberg, 2008). In the verbal-cognitive stage, learners are dealing with an unfamiliar task and spend time talking and thinking their way through what they are trying to do. As learners progress to the motor stage, they have a general idea of the movement required and shift focus to refining their skill. Progression through the motor stage often requires considerable time and practice. Some learners progress to the autonomous stage in which action is produced almost automatically with little or no attention. Other than the newest recruits, most firefighters are in the motor stage of learning when developing skill in nozzle techniques and hose handling. Developing an understanding of motor performance and learning requires a conceptual model. However, in that many of you are likely to be less excited about learning theory than I am, I will make an effort to limit this to a simple framework. Response Selection: Determination of the action needed. Response Programming: Preparation and initiation of the required action. Feedback: Determination of the effectiveness of the action (this loops back to stimulus identification and the process begins again). Many nozzle techniques such as application of a short pulse of water fog into the hot gas layer involve open loop control as the action is completed before the firefighter can receive and process feedback on the effectiveness of the action. Training must develop sufficient skill (and preferably automaticity) to allow firefighters to apply various nozzle techniques with minimal conscious thought to allow focus on maintaining orientation in the building and key fire behavior indicators. While there is much more to the story, this limited explanation of motor learning and performance provides a starting point to understand why the nozzle technique and hose handling drills are important and why they are designed the way that they are. One more bit of learning theory before we get our hands on the nozzle. This sequence of drills is designed using the Simplifying Conditions Method (Reigeluth, 1999). This approach moves from simple to complex, beginning with the simplest version of the task that represents the whole and moves to progressively more complex versions until the desired level of complexity is reached. In the case of nozzle technique and hose handling, this involves moving from basic, individual skills, to team skills, and on to integration of physical skills and decision-making. Once basic proficiency is developed in simple tasks (such as the short pulse, long pulse, penciling, and painting), practice should be randomly sequenced (rather than blocked into practice of a single skill). In addition, practice should be distributed over a number of shorter sessions, rather than massed into fewer, but longer sessions. For more information on design of effective and efficient practice sessions, see Motor Learning and Performance (Schmidt & Wrisberg, 2008). Drill 1-Basic Skills in Nozzle Operation: The starting point in developing a high level of proficiency in nozzle use is to gain familiarity with the nozzle(s) you will be using including performance characteristics such as flow rate, operating pressure, and nozzle controls (i.e., shutoff, pattern, flow). In addition, firefighters should build skill in basic nozzle techniques such as the short pulse, long pulse, penciling, and painting while in a fixed position. Click on the following link to download the instructional plan for Drill 1 in PDF format. Firefighting is team based. After firefighters have demonstrated individual proficiency in basic nozzle techniques from a fixed position, the next step is to apply these techniques in a team context. Drills 2 and 3 will be addressed in the next post in this series. Subsequent posts will address door entry procedures, indirect attack, and will introduce the concept of battle drills to build skill in dealing with worsening conditions or other emergencies while operating inside burning buildings. Hartin, E. (2004). Theoretical foundations of fire service instructor training (unpublished manuscript available from the author). Portland State University. Allen, C. R. (1919). The instructor the man and the job. Philadelphia, PA: J. B. Lippencott Company. Prosser, C. A., & Allen, C. R. (1925). Vocational education in a democracy. New York: The Century Company. Schmidt, R. & Wrisberg, C. (2008). Motor learning and performance (4th ed.). Champaign, IL: Human Kinetics.